For the past years I've been receiving questions from SavingsPinay Readers straight in my inbox. With the sender's nod I publish it live on the blog in the hope that other reader with the same question/inquiry can read my answer. Today I'll be answering a reader question that I received last January 3. If ever you too would like to ask a question then don't hesitate to email me at izzaglinofull@gmail.com I can't promise to respond right away but know that I am receiving your email and I am on the process of replying. You can also use the Blogger Contact Form for easy messaging. How to Save Money and How to Become a Millionaire? Thank you first and foremost for the question. Now, it's safe to say that saving money and becoming a millionaire are part of anyone's life goals. I'll be frank though that saving and becoming a millionaire requires a lot of next actions. You have to develop financial discipline to live below your means and become wise enough on how you spend your money. But it's not impossible. Today I will try to give a doable plan that will make you a master saver and turn you into a millionaire. If ever you are having a hard time doing your financial net worth then simply follow below action items. a. On a piece of paper or an old notebook write down how much income you make in a month. b. Now write down your any items you have that still have market value or can be sold to others and generate extra money. c. Total the above list and name it ASSET. d. Now on another sheet of paper or page in the notebook list down everything that you owe. It may be your house loan, car loan or cellphone loan. You should also write your personal debt. e. Total the amount and call it LIABILITIES. f. Lastly subtract your ASSET from your LIABILITIES. The difference is now your TOTAL NET WORTH. Knowing your net worth will enable you to create better decisions on how you'll manage your money. Study how much income you make in a month and decide for yourself how much you can actually save. 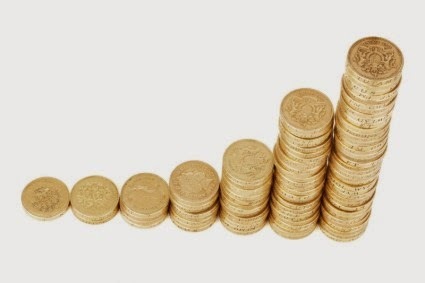 Don't set a high amount if you are on a negative financial status at the moment. I started earning with basic salary. As much as I wanted to save a lot of money it's hard especially if there are things that can ruin your budget which I have detailed HERE and HERE. But what made me get ahead of my financial struggle was developing 3 Envelopes of Your New Life. I have shared the whole story and details in a series of post. Again what's important is you set an amount to save. No matter how little or how big it is. Decide on the amount and save it consistently. Saving with a goal is much better than just simply saving. You'll be surprised how having an objective or something to look forward to could make you save more. How do we create goals? Goals should be S.M.A.R.T. meaning Specific, Meaningful, Action Oriented, Realistic and Time-bound. SPECIFY how much you want to save. Find MEANING in why you are saving such an amount. List the steps or ACTION you have to take in order to achieve the goal. Have a deadline or make it TIME-BOUND. Save 68,000pesos at the end of the year by trying the 52-Week Money Challenge for my Emergency Fund. Save 1,000pesos a month for an end-of-the-year travel/ gift to myself escapade. Save 1,000pesos every cut-off as part of my Leisure/Shopping Fund at the end of the month. Saving money could be a very difficult thing to commit. You find so many reason to spend rather than save. Now the best thong to do is to automate your savings. Set your account to automatically deduct 1,000pesos on your payroll account and transfer it to your personal savings account. This can be easily done especially if you have a payroll account via Metrobank, BPI or BDO then try applying for the online banking system. I have already blogged about Metrobank Direct and BPI Express Online. Imagine how good your life will be if you have established saving money as a priority. You'll stop being worried as to how you can survive another day or work week. You will establish financial peace and independence because you know you have reserve money in case of emergency. Be aware with why you are saving. Always remind yourself with your goals. About two years ago I published a post entitled 5 Steps to Become a 20-something Millionaire. And since I have no idea whether the our reader question sender is in her 20's or not I will try to update the 5 steps and make it appeal to anyone whether they are in their 20's, 30's or older. Saving early is still the best solution since money is co-dependent with time. The sooner you save, the more money you'll likely have in the future. But if you are in your 30's, 40's, 50's and older then the one great tip is to make saving a priority. I know you may encounter problems like food, tuition fee or the like but if you want to be a millionaire you need to make saving your top priority. No matter how much money it is... SAVE. Pay yourself first ika nga. You can't be a millionaire by just saving. You need to do something to make your money grow. And as emphasized over and over again, investing is one of the ways you can make your money multiply. Below are some helpful blog posts I have published for the past that could help you. Once you get the habit of saving and investing you need to learn to grow your investments. Diversify your investment vehicles from high-yield stocks to those who have are on top in each sector like tech giants, real estate and more. You can also diversify by investing in another investment vehicle. For example have some on direct stock, some on a mutual fund, some on a potential online business and so on. READ: Where to Invest This 2016 in the Philippines. Save as early as now. Invest today. Wake up earlier so you can avoid the traffic and get to work early. Increase your productivity so you can work better, feel better and paid better. Use your extra time to do freelance work that can pay you. Make time your greatest ally. I have read a saying once that goes like this: The richest person isn't the one with the most money, it's someone who can manage his time well. What stops you in saving money and becoming a millionaire? It could be your fears, your debts and your doubts. Now this is what I want to tell you, you need to Act. Take action. Take that one step that will lead you to your favorable financial destination. You have to do something today that your future self will thank you for. I hope this post helps. If you have reader questions you can email me directly at izzaglinofull@gmail.com or send via Blogger Contact Form Above. Thank you Ms. A for your question. 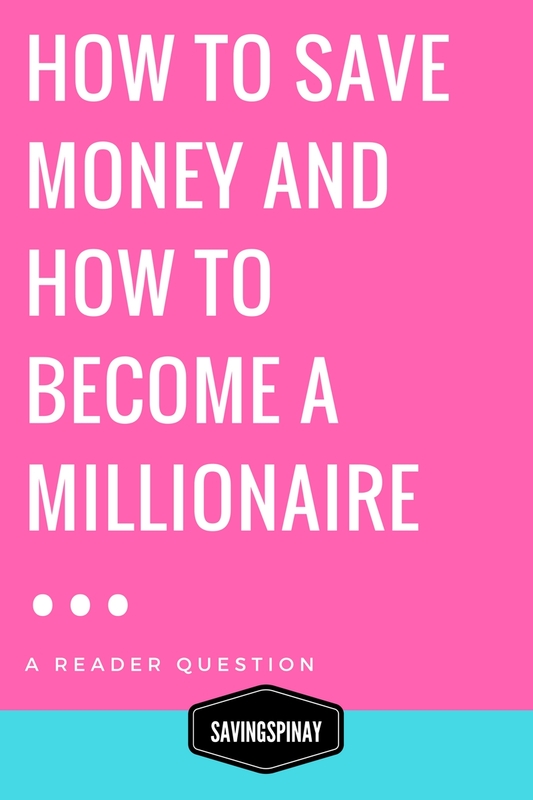 1 comment on "READER QUESTION | How to Save Money and How to Become a Millionaire?"